I was briefed by SaaS subscription and billing vendor Vindicia last week with an update on where they are – both from a business and a technology perspective. Vindicia, alongside other subscription and billing vendors Zuora and Aria, seems to be going great guns – Vindicia themselves are proud of their 85% increase in revenue YoY. 1. CashBox attempts to process all the transactions that are scheduled for a particular client on any given day. 2. Some percentage of those initial attempts fail, for a variety of reasons – the card may be over its limit, the Visa network could be down, etc. The initial success percentage can vary but typically ranges between 75-90%. – Calling Account Updater (this is a service provided by card associations that we integrate with and which sees if credit card numbers have changed – e.g., because of bank mergers, bank changing from MasterCard to Visa, etc.). This gives you a certain success rate even before the CashBox proprietary retry logic kicks in. 4. The number of successful retries in that given month represents the “saved subscribers” number you see. This retry success numbers are part of a standard report that our clients can pull from CashBox. 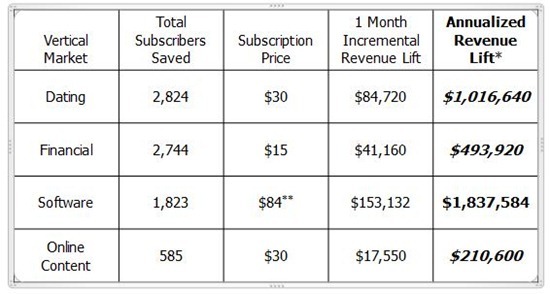 Since we know the average pricing, we can calculate the value of those saved subscribers for that month. The rest of the numbers just compute from there. 5. The value of this is not just the incremental monthly revenue, but the additional long term life that particular customer has which is why we say the numbers understate the true value of the retry logic. The contention goes that this lift is enjoyed because of a fundamental change that utilizing Vindicia has provided. That’s perhaps pushing the point a little bit, Vindicia helps by automating processes (around retrying failed charging attempts) that would otherwise have to be manually processed. As such it’s probably a little eager to put the entire revenue lift figure down to Vindicia but what the chart infers, and arguably what is more important in this discussion, is the benefit that automating processes can bring. While it is true that an army of staffers could continue trying to process transactions, the fact is that by utilizing an automated system (and wrapping some smart logic around how that system works), organizations can enjoy that extra revenue, without incurring any extra expense. And therein lies the real value of third party specialist systems – by focusing on a particular functional area they can justify building features that simply wouldn’t be viable for individual businesses. And by aggregating demand from many different customer, customers can obtain those services far cheaper than were they to build them individually. Well, but every retry costs a fee (authorization cost), even if it fails. Is that fee removed from the lifetime savings?